With Iraqi forces close to retaking full control of the city of Mosul, so-called Islamic State (IS) is about to lose its last - and largest - urban bastion in Iraq. Elsewhere in Iraq, though, the jihadist group still controls a number of towns. IS designates Tal Afar as part of its self-titled "Jazeera Province", which encompasses areas to the west of Mosul, near the Syrian border. Tal Afar was a hub for Sunni Muslim militancy long before the group's arrival. Its Shia population, including a large number of ethnic Turkmen, suffered attacks that gave rise to inter-communal tensions and provided ripe conditions for an effortless IS takeover in 2014. In addition, Tal Afar's strategic location near the Syrian border was ideal for the movement of IS militants and weapons, and this soon led to it becoming one of the group's headquarters in Iraq. For months now the town has been surrounded by the Shia-dominated paramilitary Popular Mobilisation forces, who are awaiting orders to advance. In the western province of Anbar, IS still fully controls three towns - al-Qaim, Rawa and Ana. Along with the town of Albu Kamal in eastern Syria, these areas make up IS's self-styled, cross-border "Euphrates Province". The name derives from the River Euphrates, which flows through the two countries. The province has great strategic importance to IS as the group uses routes through it to transfer fighters, weapons and goods between Iraq and Syria. It is also a symbol of the jihadists' intention to eradicate all the region's frontiers and lay to rest the 1916 Sykes-Picot agreement - something many Arabs resent. Iraqi Prime Minister Haider al-Abadi has vowed to retake Rawa, Ana and al-Qaim in the next phase of military operations against IS. IS captured the district of Hawija, south-west of oil-rich city of Kirkuk, in June 2014. The large district includes the towns of Hawija, Riyad, Rashad, Zab and Abbasi - all of which IS still holds and considers part of "Kirkuk Province". The jihadist group has also laid siege to an estimated 150,000 civilians in the area, many of whom suffer from shortages of food and medicine. Hawija came under the spotlight in April 2014, when Iraqi forces raided an anti-government protest camp by Sunnis in the town and clashed with protesters, reportedly leaving 20 people dead. The heightened anti-government sentiment in the aftermath of that incident made the town vulnerable to an IS takeover. The presence of IS in Hawija has been widely blamed for ongoing jihadist attacks in the wider Kirkuk region, as well as in neighbouring Salahuddin and further afield in Diyala. The group's media has continued to publish propaganda from Hawija, showing "normal" daily life there as well as the summary killings of alleged informants. 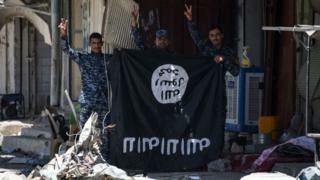 The Iraqi government was expected to recapture the town from IS before heading to Mosul in October 2016, and was criticised by local officials for failing to do so.